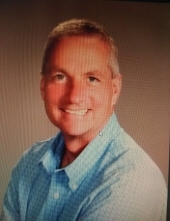 Edwin A. Gage of Munster, IN, 55, passed away at home on January 31, 2019 after a lengthy battle with bile duct cancer. Known as Smiling Ed to all, Ed was born on June 25, 1963 in Hammond, IN, the youngest child to Robert and Elizabeth Gage, who preceded him in death. He is survived by his beloved wife of 29 years, Janet (Geisen) Gage. Ed is survived by one brother, Robert Gage and four sisters, Dorothy Mysliwy, Susan (Bill) Vitkus, Judy (Tom) Grubbe, and Patricia Gage. Ed is preceded in death by sister Carol (Tom) Krasin. Ed is also survived by brothers-in-law Gene Geisen, John (Kathy) Geisen, and sisters-in-law Cathy (George) Warquier, and Jo-Anne (Patrick) Lovro. Ed is also survived by numerous nieces and nephews. Ed graduated from Munster High School where he played basketball and baseball, and attended Purdue University Calumet. He was employed by BP Refinery in Whiting, IN for 32 years. Ed was an avid fisherman and golfer, but his life centered around his deep, abiding faith, and his devotion to family and friends. Ed was the best husband, son, brother and friend. Ed knew no strangers, only friends. He had a beaming, infectious smile, piercing blue eyes, and you will never find anyone with as big a heart. He was selfless, unspoiled, uncomplicated and non-judgemental. If God weighs a person's worth on how you treat people, then Ed certainly earned his place in heaven. To honor his memory, Ed entrusted his sisters, brother, and Janet's sisters and brothers to carry on his legacy of kindness and compassion toward others. Please visit with the family and share your stories about Ed on Sunday, February 3, 2019 from 2 p.m. To 6 p.m. At Burns Kish Funeral Home on 8415 Calumet Ave., Munster, IN. Catholic funeral mass is 12 p.m. on Monday, February 4, 2019 at St. Thomas More Church, 8501 Calumet Ave., Munster, IN. In lieu of flowers, please make a donation to Hospice of the Calumet Area, 600 Superior Dr., Munster, IN 46321 or Humane Society of Munster, 421 45th Ave., Munster, IN 46321. To send flowers or a remembrance gift to the family of Edwin A. Gage, please visit our Tribute Store. "Email Address" would like to share the life celebration of Edwin A. Gage. Click on the "link" to go to share a favorite memory or leave a condolence message for the family.